A long time ago, in a studio far far away- I drew up some storyboards for a Star Wars TFA / Legos teaser-style commercial! Its a lot of fun to draw Star Wars stuff, and like everyone else on the planet, I was very excited about the new films coming out. So I’m super happy that these boards turned out so great! So the concept is pretty simple; it had to be, since the details of the movie where still very secret while we were working on this pitch. 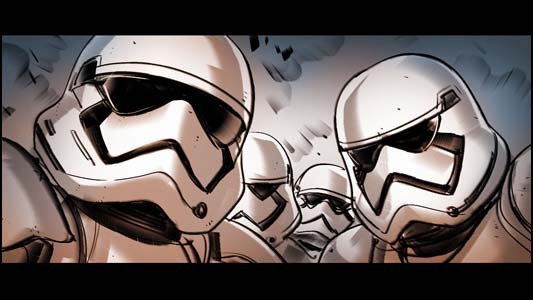 With a very cinematic, true-to-the-source/directing style approach, we create a tension and build the action as something unseen is pounding at the pod bay doors and we see a squad of stormtroopers converge in anticipation of something powerful breaking through. Boom! The doors blast open and inside is something- very small! Lego star wars characters! The main Hero lineup is there, ready for action, and they charge through and chase away the stormtroopers. Classic misdirection. I had two days to put these boards together and I think they look great- there’s a great cinematic feel to them and somehow I managed to use some colorization photo effects in photoshop to quickly add some effective color treatments. Unfortunately, we didn’t get the job, but it was a fun project!